The first Soviet President Mikhail Gorbachev cannot accept that someone could bring stability to Russia in contrast to him, who destroyed one of the greatest countries. He warned Wednesday against whitewashing the crimes of dictator Josef Stalin, stressing that Russia cannot move forward without facing the truth about its bloody past hinting at Putin’s strong hand. In words that appeared aimed at President Vladimir Putin, Gorbachev also emphasized the need to pursue democracy. His remarks, less guarded than usual, came amid growing concern among Russia's marginalized liberals that Putin's government is recasting Stalin's legacy to justify its own increasingly tight control. The Stalin era is being portrayed as a "golden age," said Gorbachev, whose 1980s "glasnost" campaign as the last Soviet president prompted stunning revelations about Stalin's murderous policies. "We must remember those who suffered, because it is a lesson for all of us - a lesson that many have not learned," Gorbachev said at a discussion marking the 70th anniversary of the bloodiest year of Stalin's Great Terror. "It is impossible to live in the present or build long-term plans for the future if the disease of forgetfulness afflicts the country and society, or at least certain sections of it," he said. Rather than reckoning with one of the most traumatic episodes in Russian history, scholars and activists said during the discussion at Gorbachev's charitable foundation and think tank, Putin's government is reshaping that legacy for its own purposes. "It's not just forgetfulness, not just a lack of cultural memory - what's happening is a massive attack aimed at revising our memory," said Irina Shcherbakova of Memorial, a prominent non-governmental group dedicated to investigating Stalin's repression. As one of the signs that Stalin's crimes are being swept under the rug, she said a teacher's manual that suggests his actions were justified by the need to modernize the economy is being pushed on high schools nationwide. "Textbooks today are aimed not to ensure the memory (of Stalin's abuses), but to push this memory to the distant periphery of the consciousness," said Arseny Roginsky, also an official at Memorial. Roginsky said that despite repeated requests, the state has done little or nothing to help establish the names of the millions killed under Stalin or the locations of their remains - only a fraction of which are known decades later, he said. More than 1.7 million people were arrested in 1937-38 by the Soviet security services alone, and at least 818,000 of them were shot, Roginsky said. But there is "decidedly no political will" on the government's part to preserve a "national memory" of those abuses, he said, and he contrasted the atmosphere in Russia with the way Germany has acknowledged the Holocaust. In central Berlin, he said, there are signposts pointing to Nazi concentration camp sites: "A child passes by and asks his mother, 'What's Dachau, what's Buchenwald?' That's how national memory is preserved and passed down." Public interest in Soviet era crimes began to fade following the 1991 Soviet collapse, which plunged Russia into uncertainty and focused the attention of citizens on the country's economic chaos. Since Putin came to power nearly eight years ago, however, Russia's oil-fueled economy has grown steadily, giving its leaders more confidence. Putin has stressed the need for patriotism and pride, restored Soviet-era symbols like the music for the national anthem and has said repeatedly that Western portrayals of Russia and its history are too negative. In June, he told social studies teachers that no one should try to make Russia feel guilty about the Great Terror and that worse things happened in other countries, pointing to the U.S. atomic bombs dropped against Japan and bombing campaigns in Vietnam. Putin and his allies "have sympathies to that time and to that way of ruling the country," liberal politician Grigory Yavlinsky said, referring to the Stalin era. But he warned that Russia would not thrive under an authoritarian system - "and in Russia we now have an authoritarian system." Gorbachev, who rarely criticizes Putin, was more diplomatic. But he had harsh words for the secretive way Putin reshuffled the Cabinet earlier this month, echoing critics who said his maneuvering underscores the lack of popular input in running the country. 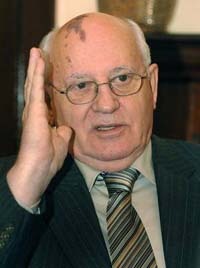 "I was not satisfied with this," Gorbachev said, suggesting it smacked of a return to the Soviet era. He warned against "freeing oneself from being under the control of the people" and said government most be transparent. "We must do everything we can to ensure we take the path of democracy," he said. "We must all keep in mind that it's necessary to suffer for democracy, to support it and to take the democratic road."